Stunning value mins from Western Albemarle schools, I64, downtown Crozet! 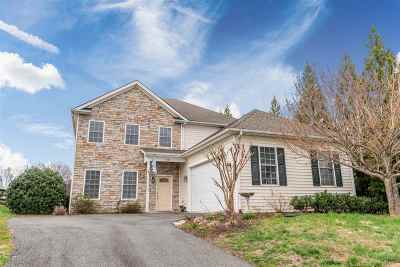 Two-story 4 BR, 3.5 BA contemporary colonial with first and second floor master bedrooms, 2-car garage plus deck overlooking fenced backyard. Hardwood floors throughout main living area. Quiet office/formal LR space at front of house. Generously-sized family room with gas fireplace, cathedral ceiling & dining area opening onto deck and level backyard. Well-designed kitchen features cherry cabinets, tile backsplash, stainless appliances, granite countertops. Laundry/mudroom between kitchen and garage. In addition to upstairs MBR, second floor features loft space overlooking family room plus two nicely-sized bedrooms sharing a hall bath.